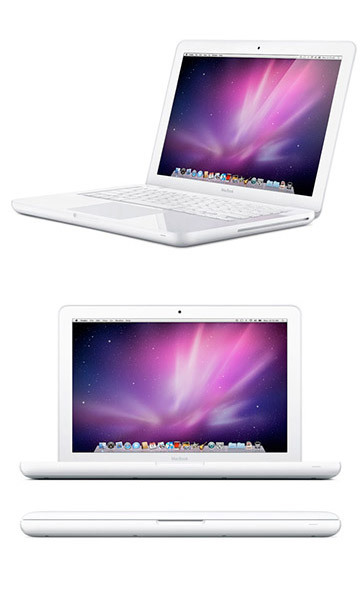 The model MacBook "Core 2 Duo" 2.4 13 inch Mid-2010 (White Poly) is running a 2.4GHzGHz Intel "Core 2 Duo" (P8600) with dual cores and 3MB shared level 2 cache, a 1066MHz frontside bus, 2GB DDR3-1066 (PC3-8500) SDRAM, a 5400 RPM 250GB SATA hard drive, an 8X DL "SuperDrive" with video supplied by a (shared memory) NVIDIA GeForce 320M graphics processor running 256MB of VRAM with a 13.3" 1280x800 widescreen LED display. 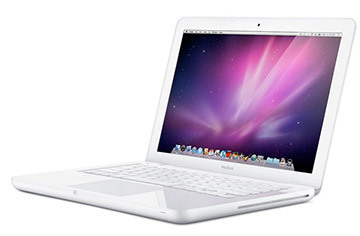 The model is housed in a white gloss polycarbonate case with a new "inertial" multi-touch trackpad and improved "MagSafe" power connector. Ports and connectivity come via AirPort Extreme (802.11a/b/g/n), 1 Gigabit Ethernet, 2 USB 2.0 ports, a single audio in/out port and a 2560x1600 resolution capable Mini DisplayPort.